We have had a wisteria vine for four years and have not had any blooms. What are we doing wrong? My husband trims regularly. 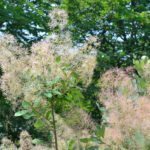 Second, we have a smoke tree and it had the 'smoke plumes' for several years and now has not had any 'smoke plumes' for about 4 or 5 years. Do we need to do something different?